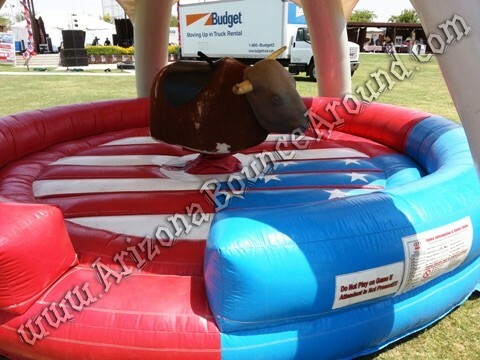 Why should I rent a Mechanical Bull from Arizona Bounce Around? 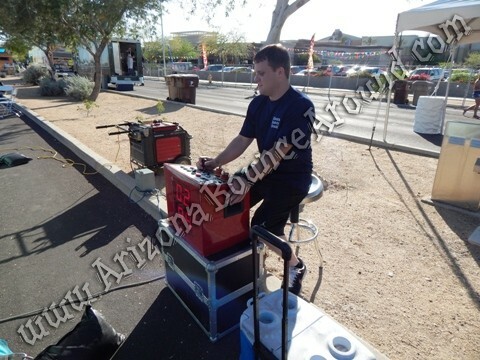 Because we are known for having “the cleanest most unique party rental equipment available” and will always deliver the WOW factor to your mechanical bull party or event. 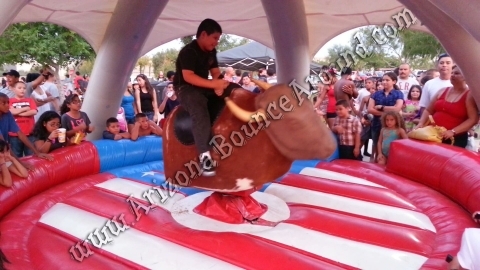 Your guests will be amazed at the mechanical bull and they are as much fun to watch as it is to ride. Our mechanical bulls are great for almost all age groups and a great party rental idea for company picnics for employees or kids. If you think a mechanical bull would be fun at a birthday party than your right. Mechanical bulls are great for birthday parties, school and church carnivals and make for some great photos and memories at your party and will be sure to bring smiles to everyone’s face. Perfect for sharing on Facebook. We have 3 different mechanical bulls to choose from. We have a western themed mechanical bull and a large mechanical bull matress perfect for super skilled mechanical bull riders. 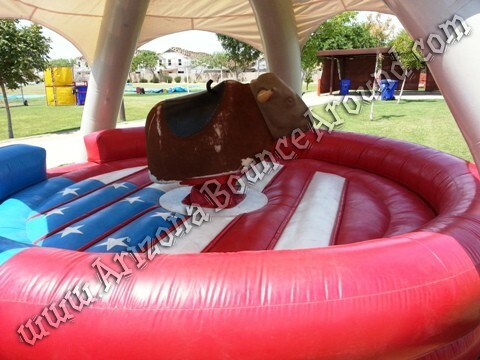 Our mechanical bull rentals come with foam heads and foam bull horns for safety. 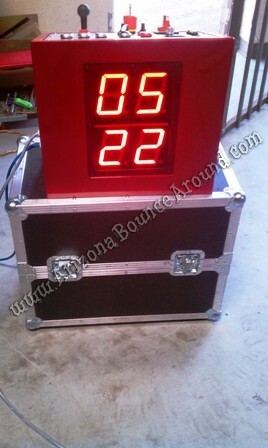 Our mechanical bull rental includes a big LED timer for bull riding competitions or just to see how long you can stay on the bull and our mechanical bull rentals come complete with an operator so you can just sit back and enjoy your party. Our mechanical bulls can be used indoors or out and can be rented by the hour starting at only $399.00 for 1 hour of mechanical bull riding. Here are some mechanical bull riding tips. 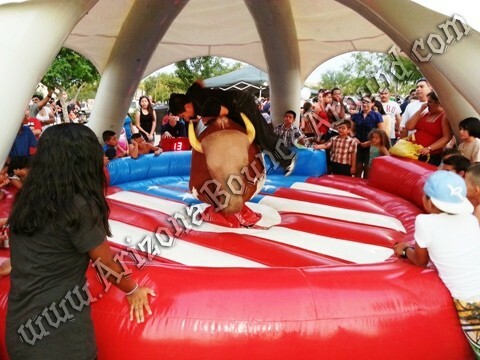 Rent a Mechanical Bull anytime of the year by adding our 20' Dome Tent. No matter the temperature outside you can still rent a mechanical bull. 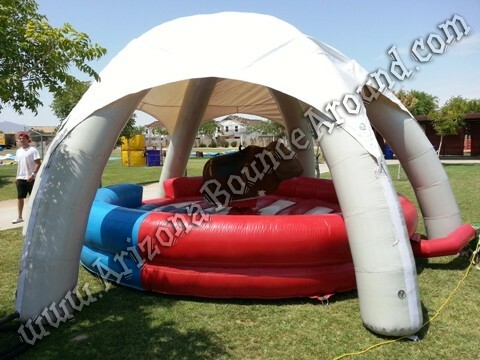 Our Dome Tent with side walls allows us to create evaporative cooled Mechanical Bull Rentals. Dont let the summer heat keep you from enjoying your party. Yου mυѕt know if уου hаνе the room nесеѕѕаrу to accommodate the mechanical bull you choose so check for dimensions for the mechanical bull set up requirements. 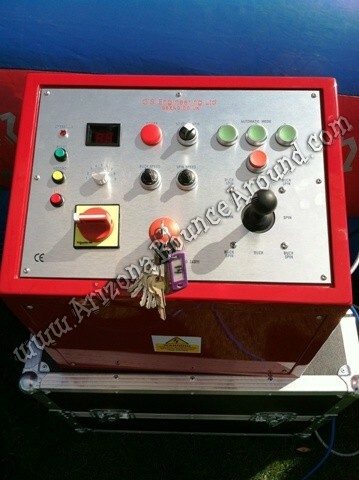 This area will include room for safety gear, the controls, аnd a spectator viewing area. If уου do not have enough space when the set up crew arrives to set up your mechanical bull then you will be stuck and spectators waiting to ride the bull disappointed potentially ruining your party. Outdoor area’s very more than inside set ups but you want to make sure the ceiling height is tall enough and doesn’t have low hanging lights or ceiling fans that the rider will hit during the bull riding or prevent set up all together. Outdoor events also have other things to think about like gate size, steps or stairs, etc. Indoor bull riding tends to be more safe and enjoyable for everyone with better lighting and free from the worry of bad weather or the mechanical bull becoming too hot during the summer. Mechanical Bull Rental History. Who started the mechanical bull craze?